What we have seen thus far in this book, with its introduction of Jesus Christ the faithful witness, a declaration of His redemptive work, the prophecy of the Return of the (real!) King; the further declaration of the Deity of Christ as the Alpha and Omega. We see that He is also The Risen LORD over the church. Revelation 2 and Revelation 3 are the LORD’s pronouncements over the seven churches, rendering to each His commendations and judgments. Revelation 4 shows John the apostle transported into heaven, where he beholds God upon His throne and the creatures there paying homage to the LORD God of all creation. Which brings us to Revelation 5 and the remarkable revelatory truths of Christ as our Holy Redeemer. Without a comprehensive understanding of this chapter, the fullest comprehension of the doctrine of redemption will not be realized. And we gain much insight into this chapter by studying the book of Ruth and the role of the kinsman goel or redeemer. 1 And I saw in the right hand of him that sat on the throne a book written within and on the backside, sealed with seven seals.2 And I saw a strong angel proclaiming with a loud voice, Who is worthy to open the book, and to loose the seals thereof? John now reports in his eye-witness account what transpires at the very throne of God. He sees “in the right hand of [God]” this book, a biblion to be precise, that is, a scroll – not a codex (What we typically think of as a book with a binding, a cover, and leaves). “Having seen the Father and His glorious throne, John’s attention is now drawn to a scroll held in the Father’s hand. The redeeming Lamb takes the scroll and prepares to open its seals, initiating God’s judgments in the Day of the Lord and beginning the reclamation of the earth in preparation for God’s direct rule. “John’s focus now shifts from the details of the throne and the living creatures and elders to that which lays upon the right hand of ‘Him who sat on the throne.’ The scene which presents itself to John is among the most sublime in all of Scripture. If ISAIAH 53:1 can be said to be the “holy of holies” of the OT, then perhaps REV 5:1 holds that honor in the NT. “The side of favor and strength (PSALM 20:6; 74:11; 80:17; 89:13; 98:1). This is the side at which the Son is seated awaiting His kingdom (PSALM 110:1; DAN 7:13-14; MARK 16:19; ACTS 5:31; 7:55; EPH 1:20; COL 3:1; HEB 1:3; 10:12) and making intercession for His Church (ROM 8:34). Jesus is seated “with My Father on His throne” (REV 3:21) and shares the power and reign of the Father (REV 5:13; 6:16; 7:10 cf. 1 KINGS 2:19). The long period of waiting while He remains seated is about to come to an end! “The position from which the Father rules the affairs of His universe (PSALM 47:8; ISAIAH 6:1; DAN 7:9-10). 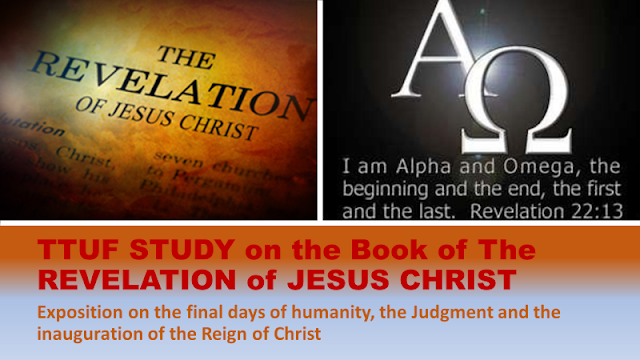 The throne pictures both sovereignty and judgment (REV 20:11). “βιβλίον [biblion], also rendered book (REV 1:11; 3:5; 13:8; 17:8; 20:12,15; 21:27; 22:7,9-10,18-19). Later, a mighty angel appears with a little book βιβλαρίδιον [biblaridion] and cries out at which seven thunders utter their voices. John is told to seal up the things which the seven thunders utter and not write them (REV 10:4). The angel then declares (even swears) that “in the days of the sounding of the seventh angel, when he is about to sound, the mystery of God would be finished, as He declared to His servants the prophets.” (REV 10:6). John is then commanded to eat the little book which will be sweet to the taste but bitter in the stomach. The book given to John, like that eaten by Ezekiel (EZEK 2:9; 3:5), apparently contains prophetic pronouncements of God, of woe and judgment, which must come to pass (REV 10:9-11). There are similarities between this scroll and these other books. This scroll is also sealed. Great prophetic streams find their fulfillment in the opening of the scroll. These similarities have led some to suggest that the sealed scroll primarily contains prophetic information previously unrevealed which is now made known through the things shown John. “What ought we to look for as the first thing, in the Apocalypse, which, as we have seen, has the end of the “many days” and “the time of the end” for its great subject, but the unsealing of this book, the sealing of which is so prominently spoken of in the book of Daniel? . . . We take it therefore that the opening of the seals of this book is the enlargement, development, and continuation of the Book of Daniel, describing, from God’s side, the judgments necessary to secure the fulfilment of all that He has foretold. “Although the loosing of the seals results in the realization of the promised inheritance (PSALM 2:8), it seems that more than just a will is in view. A purchase was made at the cross, and now the deed of that purchase is being claimed by its rightful owner. While Babylon had besieged Jerusalem, God told Jeremiah to purchase a plot of ground in Israel. Even though the land had fallen to Babylon, Jeremiah’s purchase demonstrated the reality of God’s promise to restore Israel back to the land (JER 32:14-15; 32:43-44). There are significant parallels between Jeremiah’s deed of purchase and Messiah’s redemption described in this chapter. In both cases, a purchase was made in advance and a period intervened before the possession was fully awarded at a future date. “Although [Jeremiah] had paid the price of redemption for this cousin’s land and thereby had gained the right of tenant possession, he could not take immediate, actual possession of the land for at least two reasons. “First, Jeremiah was confined in prison when he paid the price of redemption (JER 32:2-3,8-9). Second, his cousin’s land was ‘already under Babylonian control’ when Jeremiah paid for it. Because Israel had rebelled against God so persistently, its land inheritance had been turned over to foreigners (LAM 5:2; JER 32:21-24,28-36). The Jews (including Jeremiah) would be exiled to other countries, and their land would continue under enemy control for several decades; but then the Jews would be regathered to their homeland, and their land would be restored to their control (JER 32:15,37,41-44). Because he knew that actual possession of the land could not take place for many years, Jeremiah commanded that both deeds of purchase be placed in a secure place for a long time (JER 32:13-15). “The purchase price has been paid, but that which has been purchased remains in the hands of usurpers. Thus, a chain of judgments is brought forth by which the purchaser takes back what He rightfully owns. In the end, the usurpers are evicted and that which has been purchased is finally in the hands of the purchaser. “The contents of the Βιβλιον [Biblion] must be brought into relation to the whole chain of judicial acts which unfold from REV 6:1 on and from which there develop organically the visions of the trumpets and bowls. Hence, we are not concerned merely with the 6 or 7 seals themselves, but with all the last events up to the consummation. Prophetic Revelation - As the seals are removed from the scroll, events unfold which are the fulfillment of prophetic themes found elsewhere in Scripture. When the scroll has been completely unsealed and the seventh trumpet has sounded, it is said that “the mystery of God would be finished, as He declared to His servants the prophets” (REV 10:7). A Testament - The testamentary nature of the scroll is seen in the fact that only the slain Lamb can open it (HEB 9:15-17; REV 5:9). Opening the scroll ultimately brings about the outworking of unfulfilled promises of the New Covenant (JER 31:31-37; ROM 11:26-27; etc.). A Deed of Purchase - By opening of the scroll, the Lamb takes as His inheritance that which He had already purchased (REV 5:9). His inheritance includes an enduring kingdom and the title deed to the earth (PSALM 2:6-8). “Frequent references to the events of the seals, trumpets, and bowls appear throughout the remaining visions in Revelation . . . indicating that the content of the seven-sealed scroll ultimately includes the unfolding of the consummation of the mystery of all things, the goal or end of all history, for both the conquerors and the worshipers of the beast. In REV 10:7 we are told that in the days of the sounding of the seventh trumpet “the mystery of God will be accomplished, just as he announced to his servants the prophets.” From this it may be concluded that the scroll contains the unveiling of “the mystery of God” that OT prophets foretold . . . Thus the “seals” conceal the mystery, which only Christ can disclose (DAN 12:9; REV 10:4), of how God’s judgment and his kingdom will come . . . The scroll, then, is not only about judgment or about the inheritance of the kingdom, Rather, it contains the announcement of the consummation of all history. “Jeremiah signed and sealed shut one copy of the scroll deed of purchase and had witnesses sign it, apparently on the outside (JER 32:10,12). Concerning this practice, Weemse wrote, “For the manner of writing the contract, he who was to buy the ground wrote two instruments; the one to be sealed with his own signet, the other he showed unclosed to the witnesses, that they might subscribe and bear witness of that which was written. This, the witnesses did subscribe UPON THE BACK of the inclosed [sic] instrument” . . . Gaston Maspero gave an example of an enclosed document being used as evidence. “Contracts stamped upon clay tablets have been found in Babylonia, enclosed in an envelope of clay, on the outside of which an exact duplicate of the contract is impressed: if in the course of time any disagreement arose and it was suspected that the outside text had been tampered with, the envelope was broken in the presence of witnesses to see if the inside text agreed with it or not.” The fact that the sealed scroll of REV 5:1 had writing on both the inside and the outside, in the same manner as Jeremiah’s and other deeds of purchase in Israel’s land redemption system, indicates that it is a deed of purchase. “κατεσφραγισμένον [katesphragismenon], perfect tense passive: having been sealed. It was previously sealed and remains so. Various types of documents can be sealed. A document may contain prophetic pronouncements from the Lord concerning the future and be sealed until the time in which its contents are to be fulfilled (DAN 8:26; 12:4-9). Other documents, such as title deeds are sealed to protect their contents from tampering until the time in which the title is claimed. Jeremiah’s deed sealed this way (JER 32:10-14). Until the seals are broken, the contents of the book are inaccessible—they remain an unrevealed mystery (ISAIAH 29:11; DAN 8:26; 12:4-9; REV 10:7). Even in our own day, when so much within Scripture has been revealed (REV 22:10), God’s words remain a sealed book for many. This was the case in Isaiah’s day (ISAIAH 29:11-14). “In the number seven is found the symbolism of completion. See Seven: Perfection, Completeness. Within these seven seals are found all the judgments to be poured out upon the earth and the earth dwellers as part of the redemption of creation and the Lamb taking dominion over the earth. See commentary on REV 5:5. All seven seals enclose the scroll as a unit. Some commentators attempt to divide the effects which flow from the opening of the seals into separate categories: the wrath of Satan versus the wrath of God. This will not do, for it is the Lamb Who is the only one found worthy to loose the seals. He alone opens all seven seals. His initiative is as fully engaged in opening of the first seal as the last. “All seven are part of the same sealed scroll; all seven have the same purpose or function with regard to that scroll; all seven will be part of the irrefutable evidence that Christ is the true Kinsman-Redeemer; all seven will be broken by Christ; and all seven will be part of the same program of Christ’s evicting Satan and his forces and taking permanent possession of the earth. [He is also the Avenger of Blood who will render judgment and execution upon the unrepentant]. ~ Here ends commentary on REVELATION 5 by Bible Study Tools. So, as we have seen, this scroll is the title-deed of the Earth which has been purchased by the blood of the LAMB, who took the Earth back and redeemed mankind from Satan, the god of this world whose human subjects were slaves of sin. Yet not only was mankind redeemed, but the very Earth itself, and all that is contained therein. No one other could open this book, because there is only one Name under heaven, given among men whereby we must be saved: The LORD Jesus Christ (ACTS 4:12). Salvation as seen in redemption in its completed work by the Redeemer, brings merit and right to that scroll, the veritable title deed of the Earth. 5 And one of the elders saith unto me, Weep not: behold, the Lion of the tribe of Judah, the Root of David, hath prevailed to open the book, and to loose the seven seals thereof. 6 And I beheld, and, lo, in the midst of the throne and of the four beasts, and in the midst of the elders, stood a Lamb as it had been slain, having seven horns and seven eyes, which are the seven Spirits of God sent forth into all the earth. This Lion is the KING of ISRAEL and the JUDGE and Redeemer of the whole Earth, obtained by His Holy Office as the Lamb of God! He is the Root of David, that is, the very foundation and surety of the Davidic Covenant – an unconditional covenant – that entails the Kingdom of Israel which the Messiah will reign over. Only the Holy Judge would be accounted worthy to open these seals, as they are pronouncements of judgment. They are seven, the number of completion, which when once exhausted, this great judgment over the rebellious rejectors of Christ and His Gospel will be completed, the wrath of God having been spent. Note that the Lamb here has seven horns and seven eyes – expressions of “the seven Spirits of God” Horns are representative of power, authority, strength. Crowns were once fashioned out of the horns of animals, typically those of bulls – these are seven which again denote completion, even perfection. He also has seven eyes, expressing the perfect and complete vision and knowledge of all things – nothing is hidden from His sight. As for the Seven Spirits – there are not ‘seven’ Holy Spirits, as there is nothing in all of Scripture that corroborates this idea; rather there are the seven holy attributes of the Spirit of God as seen in ISAIAH 11:2. 7 And he came and took the book out of the right hand of him that sat upon the throne. 8 And when he had taken the book, the four beasts and four and twenty elders fell down before the Lamb, having every one of them harps, and golden vials full of odours, which are the prayers of saints. 9 And they sung a new song, saying, Thou art worthy to take the book, and to open the seals thereof: for thou wast slain, and hast redeemed us to God by thy blood out of every kindred, and tongue, and people, and nation; 10 And hast made us unto our God kings and priests: and we shall reign on the earth. These golden vials are full of odors, incense specifically – the sum total of all the prayers of all of God’s people, I believe, from the very beginning to the end, petitions of the oppressed righteous ones, the supplications of the suffering saints, crying out for justice (REV 6:9) – and here, that judgment is about to be unleashed, absolutely unrestrained, and without dilution. Such is the church, redeemed by the blood, out of every kindred and tongue, people and nation. Gentile nations and peoples, as opposed to the nation of Israel – and yet even this nation, for those ethnic Jews who received Christ during the church age, are made one in Christ, being baptized into the body, along with the Gentiles (EPH 2:15). As alluded to earlier, in Israel there were two tribes that priests and kings were selected from: priests from the tribe of Levi and kings from the tribe of Judah. These were never crossed over so that priests were elected from Judah or kings from Levi. Thus, the office of priests and kings were kept separate: there was no king in Israel that was also a priest and vice versa. This worship is not attributing something to the LORD that He doesn’t already possess. He already possesses all power, and riches, and wisdom and strength and honor and glory and blessing. It is in this worship that these things are recognized by those who dwell in heaven. Yet we see this word “receive” in the text; how can Christ receive that which He already possesses? Would it not be that He receives recognition of these things? That these virtues are attributed to Him and thus worthy of worship? A father may go out and buy a box of donuts for his children, bring them home and the children delightfully partake of these pastries. One of them breaks a piece off of hers and gives it to her father. The father is blessed by his daughters offering. The donuts were all his to begin with, but he is honored when his child comes to Him and makes this offering. Power – dunamis (1411); newer and higher forces that have entered and are at work in this lower world, power, ability, physical or moral as residing in a person or thing; power in action, i.e., the performing of miracles. Wisdom – Sophia (4678); higher or lower wisdom; worldly or spiritual; broad and full in intelligence; consists of knowledge of diverse matters, knowledge of human and divine acquired by acuteness and experience, summed up in maxims and proverbs (MATT 12:42); of science and learning (ACTS 7:22); the act of interpreting dreams and or visions; always in the giving of the sagest advice (ACTS 7:10). Evidenced in the discovery of meaning behind a mysterious vision or number (REV 13:18). Skill in management of affairs (ACTS 6:3); devout and proper prudence in dealing with men who are not disciples of Christ (COL 4:5); skill and discretion in imparting Christian truth (COL 1:28; 3:16); the knowledge and practice in godly and upright living (JAMES 1:5; 3:13,17). Strength – Ischus (2479); force, forcefulness, to have or hold ability, power, strength; strength afforded by [divine] power rendered to saints (EPH 6:10); the visible power expressed in the inherent personal power of Christ Jesus. This also describes the full extent of power wherewith we are to love God (LUKE 10:27). Honor – time (5092); valuables, esteem to the highest degree; dignity, precious, a valuing of . . . of the preciousness of Christ (1 PET 2:7). The inestimable value of Christ as appropriated by believers who are the “living stones” joined together with the precious corner stone, Christ Jesus. Ascription of worship; also used of believers who are acceptable for the Master’s use (2 TIM 2:21); reward for patience in well-doing (ROM 2:7). Glory – doxa (1391); glory in the widest application; glorious, honor, praise, worship; Glory [revealed] by the nature and acts of God in self-manifestation. What He essentially is and does, particularly in the Person of Christ (JOHN 17:5,24; HEB 1:3); exhibited in the character and acts of Christ in the days of His flesh [earthly ministry] (JOHN 1:14; 2:11) in the raising to life of Lazarus (JOHN 11:4); the resurrection of Christ (ROM 6:4); His ascension and exaltation (1 PET 1:21) and the Mount of Transfiguration (2 PET 2:17); the manifested perfection of Christ’s character which we all fall short of (ROM 3:23). Blessing – eulogia (2129); fine speaking, elegance of language; adoration, benediction, consecration, benefit, invocation of blessing. The saints who worship Christ according to the witness of Christ’s self-revelation are inspired all the more in their love and adoration of the Lamb of God for all of His virtues. These saints are innumerable: “the number of them was ten thousand times ten thousand, and thousands of thousands” that is ten thousands times ten thousands, then multiplied by thousands of groups comprised of thousands. Comparing these verses with what we see in our text found in REVELATION 5, we understand that the “few that are saved by finding the narrow way” are relative to the “many” who go down the broad way. There are few that are saved, but even these few are actually an innumerable multitude, despite the fact that the vast majority will be condemned on the Day of Judgment. 13 And every creature which is in heaven, and on the earth, and under the earth, and such as are in the sea, and all that are in them, heard I saying, Blessing, and honour, and glory, and power, be unto him that sitteth upon the throne, and unto the Lamb for ever and ever. 14 And the four beasts said, Amen. And the four and twenty elders fell down and worshipped him that liveth for ever and ever. “Every creature” is fascinating to me – does this encompass all living creatures that have breath? That seems to be what this is suggesting; and note the locations – not just in heaven and on Earth, but also in the sea and under the Earth. What this entails precisely I don’t know. Yet what I do know however is that Christ will be honored, glorified and worshiped by all that has breath as the Name above all names! Here ends Chapter 5 - next time we shall witness the breaking of the seals of the scroll which Christ apprehended from Him Who sits on the Throne.